Centrifugation is a process that involves the use of the centrifugal force for the separation of mixtures, used in industry and in laboratory settings. In chemistry and biology, centrifugation increases the effective gravitational force on a mixture in a test tube, to rapidly and completely bring the precipitate ("pellet") to the bottom of the tube. The remaining solution is called the "supernate," "supernatant," or supernatant liquid. The supernatant liquid is then separated from the precipitate by decantation or withdrawal with a Pasteur pipette. The equipment used for centrifugation is called a centrifuge, and the vessel that spins the samples is called a rotor. Generally, a motor causes the rotor to spin around a fixed axis, applying a force perpendicular to the axis. The centrifuge works using the sedimentation principle, where the centripetal acceleration is used to separate substances of greater and lesser density. There are many different kinds of centrifuges, including those for very specialized purposes. In the chemical and food industries, special centrifuges can process a continuous stream of particle-laden liquid. English military engineer Laval (1707-1751) invented a whirling arm apparatus to determine drag, and Antonin Prandl invented the first centrifuge in order to separate cream from milk to make it easier to churn butter. 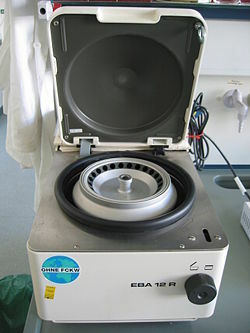 Centrifuges are used in chemistry, biology, and biochemistry for isolating and separating suspensions. They vary widely in speed and capacity. They usually comprise a rotor containing two, four, six, or more numbered wells within which centrifuge tubes containing the samples are placed. Other centrifuges, the first being the Zippe-type centrifuge, separate isotopes of chemical elements. These kinds of centrifuges are in use in nuclear power and nuclear weapons programs. Gas centrifuges are used in uranium enrichment. The heavier isotope of uranium (uranium-238) in the uranium hexafluoride gas tend to concentrate at the walls of the centrifuge as it spins, while the desired uranium-235 isotope is extracted and concentrated with a scoop selectively placed inside the centrifuge. It takes many thousands of centrifuges to enrich uranium enough for use in a nuclear reactor (around 3.5 percent enrichment), and many thousands more to enrich it to atomic bomb-grade (around 90 percent enrichment). The 20 G centrifuge at the NASA Ames Research Center. The U.S. Air Force at Holloman Air Force Base, New Mexico, houses a human centrifuge. It is operated by the aerospace physiology department, to train and evaluate prospective fighter pilots for high-g flight in Air Force fighter aircraft. Standalone centrifuges for drying (hand-washed) clothes—usually with a water outlet. Protocols for centrifugation typically specify the amount of acceleration to be applied to the sample, rather than specifying a rotational speed such as revolutions per minute. The acceleration is often quoted in multiples of g, the acceleration due to gravity at the Earth's surface. This distinction is important because two rotors with different diameters running at the same rotational speed will subject samples to different accelerations. The acceleration can be calculated as the product of the radius and the square of the angular velocity of the rotor. The settling velocity of particles in the samples is a function of their size and shape, centrifugal acceleration, the volume fraction of solids present, the density difference between the particle and the liquid, and the viscosity. Relative centrifugal force is a measure of the force applied to a sample within a centrifuge. This can be calculated from the rotational speed and rotational radius using the following equation. ↑ The term "supernatant" is both a noun and an adjective. Selection of historical centrifuges in the Virtual Laboratory of the Max Planck Institute for the History of Science. This page was last modified on 24 January 2017, at 17:01.